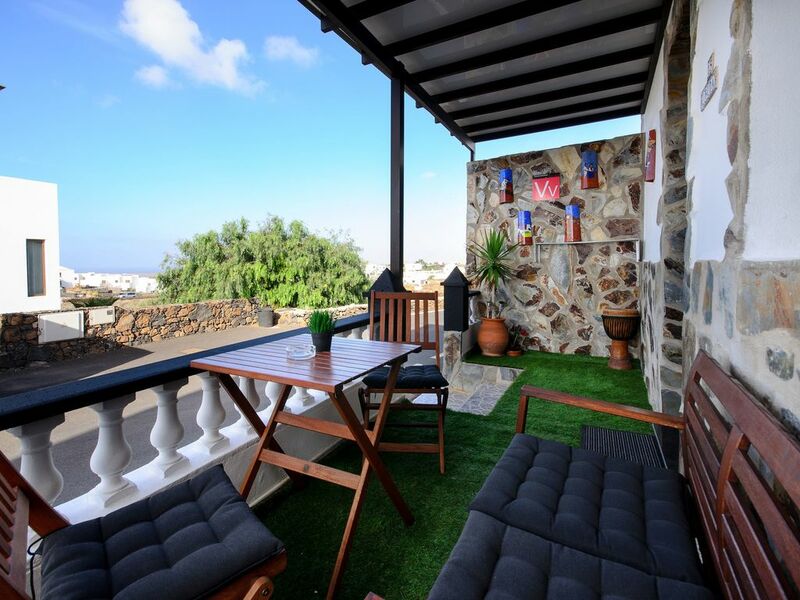 Situated on the outskirts of Tinajo, near the northern coast of Lanzarote and the expansive Los Volcanes Natural Reserve, the holiday apartment Buda is perfect for a restorative holiday immersed in the unique natural landscape of the island. Integrating the rustic texture of natural stones with a cosy atmosphere, the apartment is located on the ground floor and consists of a living/dining room with a sofa bed, an adjoining, well-equipped kitchen, one bedroom with a king size bed as well as one bathroom and can therefore accommodate 4 people. Additional amenities include Wi-Fi, fans, a washing machine, and satellite and cable television, as well as a baby cot, a highchair and children’s book for the younger guests of the property. Outside, you are invited to relax on your spacious porch, equipped with a table and chairs. From here, you have a fantastic view of the mountains and the ocean in the distance. A perfect place for a glass of wine to round off your evening! A supermarket as well as a selection of shops, restaurants, bars and cafes are located in the centre of Tinajo, which is 1.4 km or a 4-minute drive away. Several beaches are within a 13-minute drive from the property: the rural beach Playa Teneza, with its black sand and pebbles, as well as Playa El Complejo in La Santa, which is known for some good surf spots! Street parking is available. Bed linens and towels are included in the price.